This decal sheet comes in 1/72 scale. 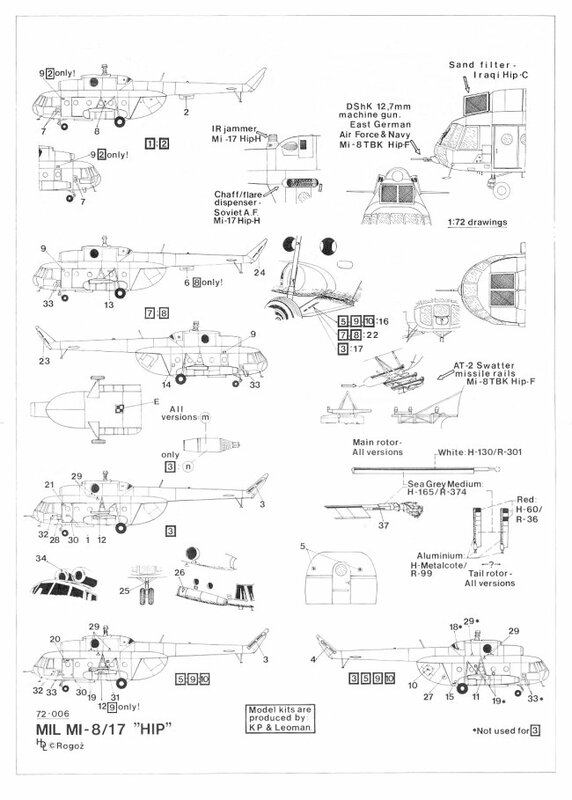 The decal sheet includes stencils for one aircrafts and markings for 10 different Mi-8 and or Mi-17's. 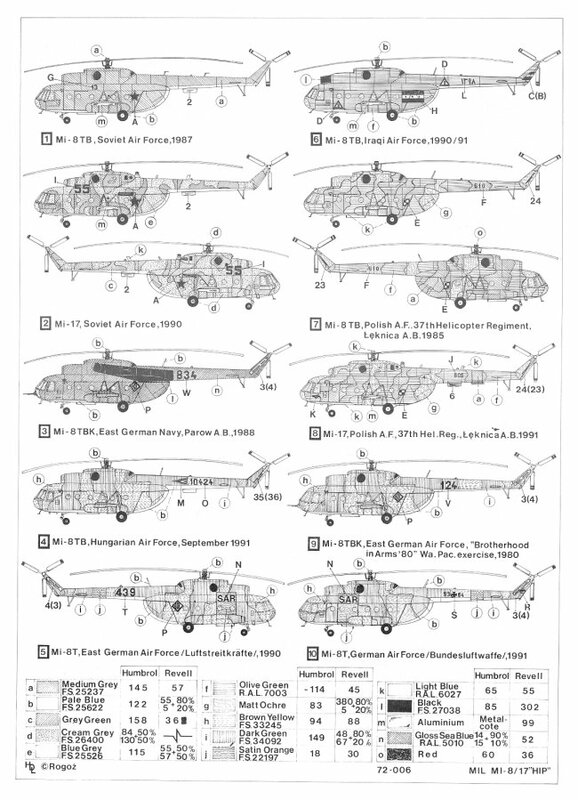 This decal sheet covers the Mi-8 and Mi-17 HIP from 6 different airforces including Polish, Soviet, German, Iraqi (Desert Storm), and East German and Hungarian. The painting options include everything from a Medium Grey all over to Olive green all over to camo combinations of Medium Grey/Olive Green/Matt Ochre to Brown Yellow/Satin Orange to Brown Yellow/Dark Green combination. The Iraqi aircraft has a very large Iraqi flag on both sides of the rear fuselage. Also included in this sheet are markings for 2 Search and Rescue helicopters. The quality of the sheet is good....excellent colours.....clear printing and completely in register although the stencil data for the 1/72 stencils are too small to be clearly printed and readable. 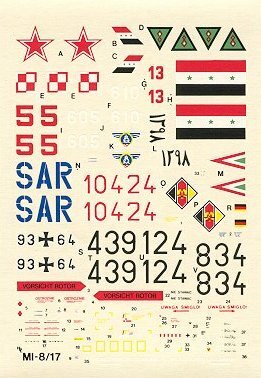 I recommend this sheet to anyone looking for interesting options to the kit decals. Decal option #1 is an Mi-8TB of the Soviet Air Force in 1987. This particular chopper is painted Medium Grey FS 25237 all over with Pale Blue FS 25622 on the underside. Decal option #2 is an Mi-17 of the Soviet Air Force in 1990. This particular chopper is painted Grey Green and Cream Grey FS 26400 with Blue Grey FS 25526 on the underside. Decal option #3 is an Mi-8TBK of the East German Air Force out of the Parow Airbase in 1988. This particular chopper is painted Gloss sea Blue R.A.L. 5010 all over with Pale Blue FS 25622 on the underside. Decal option #4 is an Mi-8TB of the Hungarian Air Force in September 1991. This particular chopper is painted Brown Yellow FS 33245 and Dark Green FS 34092 with Pale Blue FS 25622 on the underside. Decal option #5 is an Mi-8T of the East German Air Force / Luftstreitkrafte in 1990. This particular chopper is painted Brown Yellow FS 33245 and Dark Green FS 34092 and Satin Orange FS22197 with Pale Blue FS 25622 on the underside. This chopper is a Search and Rescue chopper and has big blue SAR letters on the sides. Decal option #6 is an Mi-8TB of the Iraqi Air Force in 1990/91. This particular chopper is painted Olive Green R.A.L. 7003 all over with Pale Blue FS 25622 on the underside. On both sides of the fuselage are large Iraqi flags. Decal option #7 is an Mi-8TB of the Polish Air Force 37th Helicopter Regiment out of Leknica Airbase in 1985. This particular chopper is painted Matt Ochre and Medium Grey FS25237 and Olive Green R.A.L.  7003 all over with Light Blue R.A.L. 6027 on the underside. Decal option #8 is an Mi-17 of the Polish Air Force, 37th Helicopter Regiment out of Leknica Airbase in 1991. This particular chopper is painted Medium Grey FS25237 and Matt Ochre and Olive Green R.A.L. 7003 with Light Blue R.A.L. 6027 on the underside. Decal option #9 is an Mi-8TBK of the East German "Brotherhood in Arms '80" Warsaw Pact exercise in 1980. This particular chopper is painted Dark Green FS 34092 and Brown Yellow FS 33245 with Pale Blue FS 25622 on the underside. Decal option #10 is an Mi-8T of the German Air Force / Bundesluftwaffe in 1991. This particular chopper is painted Brown Yellow FS 33245 and Dark Green FS 34092 and Satin Orange FS 22197 all over with Pale Blue FS 25622 on the underside. This chopper is a Search and Rescue chopper and has big blue SAR letters on the sides.